2 - I know this is a little past due, but here's pictures from L's first day of school. When she grows up she wants to be the Queen of the Butterflies. No one better get in her way! Shortly after I took this picture she looked up at me, waved, and said, "Bye-bye." I was dismissed. 3 - JF also had his first day of school. He's in the Early Childhood Education classroom... which is sort of like special ed preschool... it's because of his apraxia. As you can see, he likes suckers, coloring, and ice. Sometimes he cries when I drop him off and sometimes he doesn't but the tears don't last. He has a blast every day, which is easy to see when I pick him up and he's obviously enjoying himself and oblivious to my presence. 4 - When we're in the car I usually just want to listen to the radio. The kids often want to talk to me. Today I missed out on awesome songs like Royals and Roar and Monkey Man. I tried to explain that its not every day that The Specials are on the radio so I really wanted them to be quiet for Monkey Man but no dice. I guess they just can't appreciate ska music. 5 - Two special prayer requests. First: We're having an open house on Sunday from 2-4. We've lowered the price of our home again and we're really, really, really hoping someone will buy our house very soon. Please pray that people will come and we'll end up with a good offer. Second: My cousin's son is very sick with c-diff. He's been really sick for a long time and is currently in the hospital for his second stay this month. Please pray that little Noah will get well soon - or how about right now?! - and please pray for his parents as they navigate all this. On the other side of those curtains are French doors that lead to a sunroom that has a view of our huge, green, tree-lined backyard. 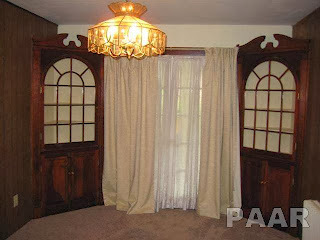 As far as I'm concerned there's no need for those drapes and I intend to take them down asap. A new light fixture for sure. I think I'd like to paint those built-ins white but paint the backs of them a rich, pretty blue. The paneling, well I don't know what I'll do with the paneling. I'd love to get rid of it but that might be too big of a project for right now. Ben has requested a slide to get off the top bunks and I think it's a great idea. This way we can have family movie nights and the kids can just fall asleep in the bunks. If there's a tornado warning at night we can all just go to sleep in the basement. If people come to visit there will be open beds. When the kids get older and have slumber parties we'll be all set up. I love it. 7 - We harvested a bunch of tomatoes recently. Look at all those beauties. The Little Tykes wagon came in very handy for the harvest. Thanks, kiddos! I washed them off, blended them up, boiled them down, and added some yummy seasoning. They made a delicious marinara sauce. We used it on homemade pizza last night and Italian nachos tonight. Delicious. Many thanks to Jen for hosting! I LOVE that bunk bed wall! If I ever have a basement I am totally doing that. "The Queen of all butterflies." I love it! :) Little girls just crack me up! I recently saw bunks like that in a magazine at the Dr. and fell in love. I'm dreaming of them for our 2nd-story addition if/when that ever happens. 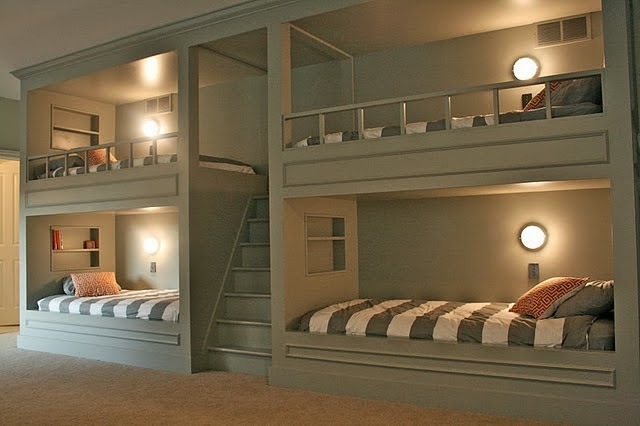 With 3 girls, those bunks provide a tiny bit of privacy without additional rooms. Space-effecient *and* amazing cute! I love the idea for a basement though for every reason you listed. Brilliant! I love every song you've ever directed me to. We should probably be real friends. Those tomatoes are beautiful. My mom used to grow them and store bought just doesn't compare. Lydia and James are so cute! Oooo I just love corner built ins! That room is going to look dynamite when you are done with it:) Is the paneling real wood? It would probably look awesome if you painted it. Prayers to St Joseph that you sell your house! You are amazing. Prayers for the real estate! St. Joseph is my man - He knows how much I need good men watching out for me (God the Father, Jesus, my own Dad, my husband, and a host of many Saints! ), and he always comes through. :) Peace & blessings to you guys! My daughter was hospitalized for C. Diff about a week before her first birthday. it was so scary. Lots of probiotics are in order.....I had to figure that out on my own. Prayers for selling of your house and hope the open house went well! Oh Italian nacho's, those sound yummy! You can paint paneling and it usually turns out pretty nice. Way easier than taking it down!